For the first week, use every day for twenty minutes. Then use for twenty minutes every other after that. See the chart below, which gives the usage pattern. It is normal for shedding to occur as your hair goes through a period of new growth. Do not use every day after the first week. The hair will stop responding to the laser. It is best to use on a clean scalp. If you use topical products, use them after using the laser. It can take up to about four months to see very positive results from the sessions. Don't get discouraged and give up. 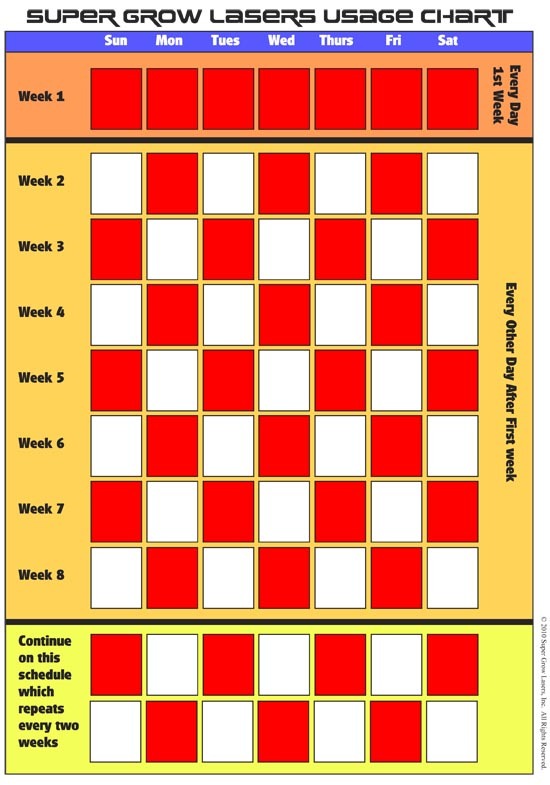 The chart below shows you how to schedule your initial sessions. When setting up your laser, you want to make sure that the system is stable. On some of the higher laser units especially, the laser head can get pretty heavy due to all the lasers inside. The right way to set up the laser is to keep the laser head over one leg of the stand. This gives the solid support needed for so many lasers. Always keep the head over one of the legs, and even the heaviest laser dome will be completely stable. 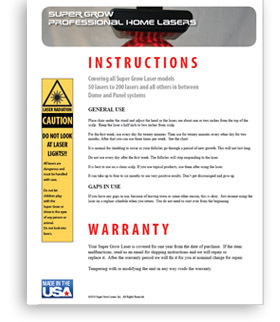 To download the manual click here.